You want a custom deck for your home, but are unsure if it is worth the investment. This is a common sentiment. Coloradans who invest in a professional deck installation often report high levels of satisfaction. Oftentimes, homeowners seek out a local decking company across Larimer County online to find the most qualified source to turn your vision into a reality. If you need assistance in creating a valuable and affordable result for your home, our deck builders are happy to help. Since 1992, we’ve worked to develop the highest standards for all of our services, including deck installations, residential fences, pergola designs, and more. Rocky Mountain Fence & Decks is here to turn your vision into reality. For many homeowners, this vision comes from a personal goal or motivation. 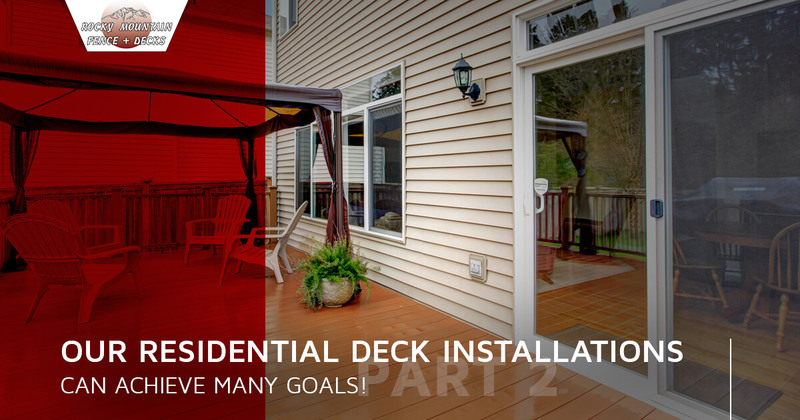 Today, we’ll continue to discuss a few goals that our outdoor decking solutions can achieve. If you’re ready to get started on your home design, be sure to call us or fill out our estimate form! Homeowners hoping to simply take in the clean Colorado air can benefit from deck installations of all sizes. You have the power to personalize your deck design to enhance the beauty surrounding your home. Properties with quality landscaping can incorporate their deck into the mix to create a sanctuary, complete with shade. Your deck can also bring you closer to nature. Photographers of all skill levels can benefit from the angle of their position, capturing stills of bird feeders, local squirrels, and so on. With the influx of gadgets and nonstop media, it can be hard to unplug and spend time with your loved ones. A new deck proves the perfect place for unwinding with the family, whether it involves relaxing and chatting, enjoying a breakfast together, or anything you can think of. Parents can enjoy the comfort of sitting on their sturdy deck while the kids play in the yard, within close proximity. Regardless of the activities, your loved ones will remember the fun and bonding involved. While our deck contractors recommend caution on the species introduced into your home’s exterior, outdoor decking can prove the perfect opportunity to expand your gardening operations. Planter boxes can be affixed to your deck railings, along the floors, or down the sides to create a panoply of vibrant color. Lattice systems can provide support for vines, water lines, and other verticals to keep your garden flourishing. The design choice is yours, so be sure to plan ahead for a naturally beautiful outcome! For some, the yard is the perfect place to be active, but lacks the surface needed to get the job done. A new deck provides premium square footage, opening up the opportunity to perform your morning stretches, yoga routine, tanning regimen, and more. Our custom deck solutions can enhance the outcome, such as benches and storage to help create your outdoor gym. Homeowners with mobile weight systems can also workout in the privacy of their backyard. You don’t have to commute to the gym to keep in shape, and our deck contractors can help to find an ideal outcome. The Front Range is home to amazing views of the Rockies, and a new deck installation may prove to be the perfect platform to spectate nature’s majesty. Many of the parks and open spaces along Loveland and Fort Collins are strategically located to provide unobstructed mountain views. If you have an ideal location to survey the foothills and beyond, be sure to call our deck contractors for a quote. We can provide an affordable price that results in a long-lasting surface that will provide decades of quality views. All of these enhancements to your Larimer County home can undoubtedly result in one outcome — higher property values. Why? Potential buyers have their own unique goals and plans when shopping for a home, and your deck installation may provide an added incentive to buy. In most cases, your local decking company can provide quality results that offset much of the cost of the installation. The result is a new deck that is warrantied for added peace of mind, allowing you to make the most of your new outdoor living space. Rocky Mountain Fence & Decks is here to provide complete deck solutions across Loveland and Fort Collins. Contact us today or fill out our estimate form to begin!